1. In a small saucepan over low heat, combine the garlic and red pepper flakes with 1/2 to 1 cup of oil, making sure you have enough oil to cover the garlic cloves. Cook at a low simmer until the garlic starts to brown, about 20 minutes. Remove the pan from the heat and allow the garlic to cool in the oil. The garlic will continue to soften and brown until the oil cools. Set aside. 2. Pour 1/4 cup of the garlic oil onto a sheet pan. Dredge the steaks through the oil, coating both sides. Season evenly with salt and pepper. 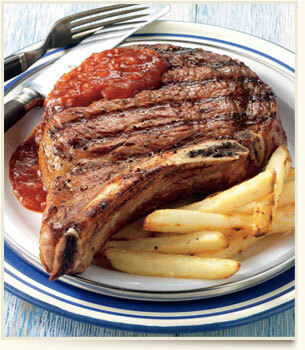 Allow the steaks to stand at room temperature for 15 to 30 minutes before grilling. 4. Brush the cooking grates clean. Grill the steaks over direct high heat, with the lid closed as much as possible, until cooked to your desired doneness, 6 to 8 minutes for medium rare, turning once or twice (if flare-ups occur, move the steaks temporarily over indirect heat). Remove from the grill and let rest for 3 to 5 minutes. 5. Serve the steaks warm, topped with a generous sprinkling of salt and some garlic. Spoon some of the garlic oil over the steaks, if desired.